Spectre Performance Air Intake System 10-12 Ram HD 6.7L Diesel [Spectre 9991 Intake System] - $205.95 : 3rd Strike Performance, Your Source for Late Model MOPAR Performance Parts and Accessories! Spectre Performance air intake systems provide better acceleration and fuel economy for your truck or SUV. They're designed to replace your factory air filter and air box assembly, getting rid of the restriction as they smooth and straighten airflow. The high-flow design of these intakes enables your engine to breathe in a larger volume of air, resulting in more usable power throughout the engine's entire rpm range. Hundreds of models are available, with various tube and filter options. 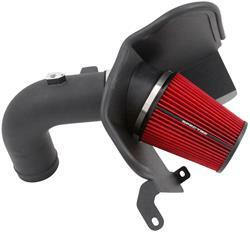 Air Intake, Cold Air, Red Filter, Black Aluminum Tube, Dodge, Ram, 6.7L Diesel, Kit.